BVAdvanced Fluids offer a full line of specialty products designed to meet the requirements for use with a wide variety of gases. Considerations such as the type of vacuum pump, the nature of the gas, and the selection of a sealant fluid. Some of the possible fluid selections available are describe below. 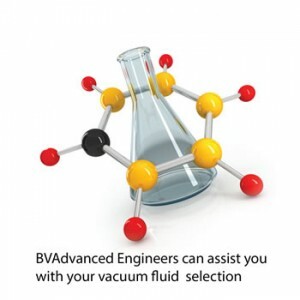 BVAdvanced Vacuum Fluids are synthetic, semi-synthetic or mineral oils. Major advantages of synthetic and semi-synthetic oils are their low vapor pressure in relationship to viscosity and they are non-toxic. Low/ Medium Vacuum Pumps Low to medium vacuum pumps commonly use the same type of fluids used for compressors. The fluid is generally used to provide a proper fluid seal, act as a coolant, and lubricate the moving parts. The highest vacuum are achieved with fluids that have a minimum of low boiling fractions. This minimizes the formation of oil mist and the occurrence of condensation in other parts of the vacuum system. Fluids with lower vapor pressure characteristics also allow for higher vacuum. Typical vacuum pumps in this classification are piston, rotary, and liquid ring pumps. The fluids listed above may also be suitable for high vacuum pumps, particularly the higher viscosity grades. In addition to oxidation by air and water, these fluids also provide excellent thermal stability and water separation. They are non-toxic, a decided advantage. SHP-14-F are chemically inert to many acids and other types of process chemicals. These fluids contain no additive for oxidation resistance. They have been used extensively in ethylene oxide applications requiring their ‘food-grade’ status under FDA regulation 21CFR178.3570. They are also available with additives (consult BVA for proper selection). BVAdvanced UPSI Series products are particularly suitable for chlorinated solvent applications and for reciprocating and vane pump applications. They have handled combinations such as HCL/MeCl and water vapor. The BVAdvanced PGNS and PGSW Series products have been used where dilution by normal hydrocarbon gases is undesirable. PGSW-7- 100 and 150 from this series have excellent vapor pressure characteristics. The fluids described represent only a few possible selections from the available products. BVAdvanced’s engineers and technicians are available to assist with individual processing applications.